Is the real focal point with this match-up the return to Memorial Coliseum? Aside from the drama surrounding playing time, offensive touches, Andre Miller, the media and Brandon Roy's USA status, people really just care about the return to a building that should have been torn down years ago, right? Ick. We'll have a starting lineup reminiscent of RAMBO sans the B leaving us with RAMWO (Shamwow?) or WRAMO (Silent W!) We'll have the returns of Channing Frye in a starting role along with "Thunder" Dan Dickau hoping to find a niche in an offensive juggernaut. 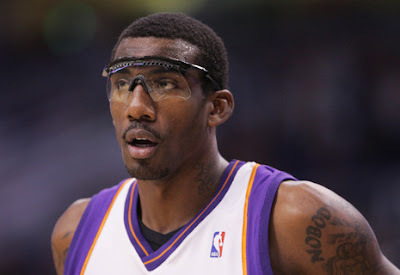 We'll have Amare Stoudemire's awesome goggles. 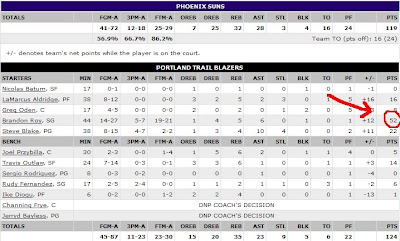 We'll have Steve Nash another year older. And possibly even a chance to get torched by another Griffin. That give you enough to go on?